Please see our "How to get started page" for guidelines ideas and templates for your application process. Do you still have questions? Please contact your local Green Center. Find your local Green Center here. When did I last certify? Please see our current list of Green Schools and the date of your last certification here. If you add four years to that date, that is year you need to recertify. What format can be used to submit the application? We prefer to receive an electronic format over a hard copy compiled in a binder. We are suggesting that schools use a free website design program like Weebly (weebly.com) or submit a PowerPoint presentation. Some schools are creating the application as part of their school's current webpage. How do you make a weebly or prezi? Making a weebly is really easy. Directions on how to make this can be found here. If a school is resubmitting an application from the previous year, do they need to file an Intent to Apply? If you paid the Intent to Apply fee the previous year and either did not receive the award and would like to resubmit or failed to submit your application on time, you do not need to pay again for the consecutive year. However, you still need to fill out the intent to apply so that the office knows you are applying. Can I use an old application guide from a past year if I already started working from it? No, you must use the application guide for the current year of your application. Application Guides are subject to change requirements from year to year. This is especially important for schools that are re-submitting. The most current version can be found on our website. I am submitting an application for 3rd recertification is it the same as the New schools, 1st and 2nd recertification? No, the Sustained School Application is only for schools that are on their 4th application process. This means they were originally certified and then successfully recertified twice. If a school meets this criteria please make sure they are utilizing the Sustained School application relative to their grade level. Please contact your local Green Center first. You can find your local Green Center here. If you still have questions and would like the assistance of a Green Leader, please email greenschools@maeoe.org with your school name, the district, and whether your school is public or private. When is the intent to apply and the current application becoming available? Every year the Green Schools committee reviews and edits the Green School application during the summer. Each fall, the application becomes available online. The intent to apply usually opens in early September. Please visit the requirements to apply around those times. Are there any templates to use for PowerPoint? Yes! Thanks to the William S. Schmidt Center we have a template. Access the template here. However it is not required and feel free use your own! What should you do if you are not certain you have permission to use a photograph of a particular student? If you do not have permission or if you are in doubt, do not use the photo. Other options include cropping the student out of the picture or blurring the face of the student (this can be done in programs like Photoshop). 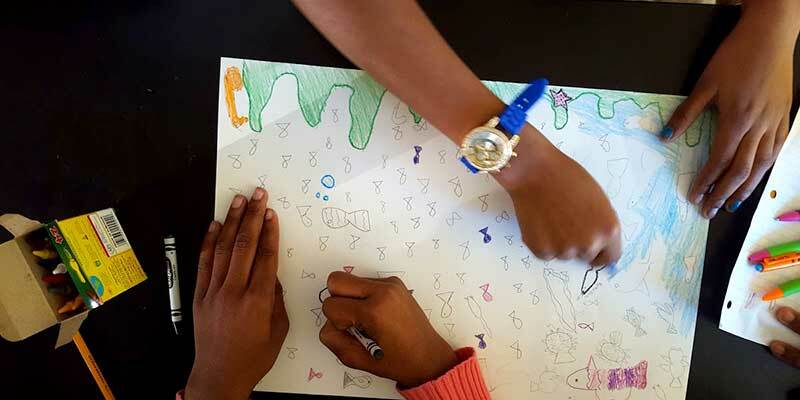 Is a lesson plan considered enough documentation for the environmental instruction objective? A lesson plan can be submitted as additional documentation, but ONLY IF it also includes some sort of evidence that the students did the activity. For example a copy of a student's completed work, a student's written reflection of what they did and learned, and/or photographs showing the students at work and engaged. What are other ways to document environmental instruction? Other suggested types of documentation include student work, photos of bulletin boards, photos of students engaged in activity, student reflections, and students' assessments. If one teacher attends a PD, then returns to the school and trains fellow teachers, can those additional teachers count in the 10%? The training of the additional teachers WOULD ONLY count towards the 10% if the original person who attended the PD was trained to teach the PD themselves. How do you document Professional Development? It is important to include the name of attendees, date, and a brief description that includes who facilitated the training. Include at least one piece of documentation, such as agendas, sign-in sheets, email confirmations, correspondence and copies of activities/materials. How do you describe/document the "majority of staff are engaged in EE activities affiliated with the school" and the "all staff is aware of the Green School Application process? Describe and cross reference how staff is involved in Environmental Instruction and BMP activities. Document the method in which teachers were informed of the application process. For example, Ms. Smith, chair of the school Green Team, addressed the staff at meeting on Nov. 4th, describing the Green School application and how staff and teachers can assist. If teachers are doing a training on their own, outside of school, can it be applied to PD for the Green School application? Yes, as long as it has an Environmental Education component that can be applied to their teaching. What are the requirements for a Celebration? This event must be annual and school-wide. What if our school population is too large for the entire student body to gather together for one event? Events can be broken up into smaller groups, but all students need to be part. For example, if the event is a trash pick-up, every grade may pick up trash at different times on the same day and then followed by a celebratory ice-cream party. The event can also be done in a week or month, so as long as all students participate in the same themed-event. Another good example includes Earth Hour where the whole school turns out the lights. How can elementary school students lead sustainable practices? Younger students can be involved in identifying a need, conducting audits, petitioning for change, design planning or installation. The application review committee is aware that there is a strong adult component to these activities, but the students must be involved in the process. What are some suggested ideas to document student-lead sustainable practices? Photos, student reflection, student created blue–prints and plans, newspaper/newsletter articles, correspondence, student surveys and audits. No. The Mid-Atlantic Sustainable School (MASS) FieldScope website is no longer required. To enter your school's metrics, please go to the metric survey link found in the Green Schools "Requirements to Apply" page. Does an annual field trip to the same organization count as a sustained partnership? A partner may be someone who donates supplies and/or time. May serve as guest speaker/correspondent for students and staff. Assists with time, labor or expertise on projects. Organization that facilitates annual field trips. My PowerPoint is too large to submit in an email. What do I do? There are three ways you can submit a large PowerPoint. Submit it on a USB or CD by mail or arrange a drop-off site with MAEOE. Put it in a Dropbox account and send the link to applications@maeoe.org. Dropbox is a free website where you can upload files and share them with others. You can upload it into a Google doc and share the document with us. Please send the link to maeoerocks@gmail.com and greenschools@maeoe.org and add public viewing rights. Is it okay to include lots of photo files on my flash drive without inserting them into the PPT or website? No. It's prohibitively time-consuming for reviewers to have to figure out the organization of an application. Applications need to be coherently organized into the categories prescribed by MAEOE. Get answers to commonly asked questions about the Green Schools application process.